Our New Year's Eve dinner highlight was a Fu Gui Ji 富貴雞, commonly known as beggar chicken (乞丐雞 chi gai zi) or (叫化雞 jiao hua zi). 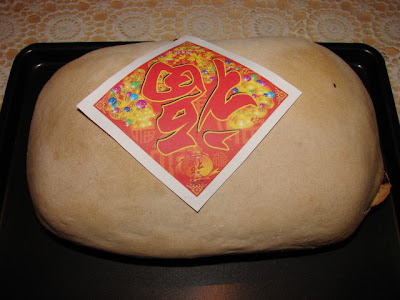 I preferred to called it Fu Gui Ji 富貴雞 for this occasion because fu gui 富貴 means fortune and prosperity. This beggar chicken recipe started a long time ago in Hangzhou 杭州, China. The story was a beggar stole a live chicken from a village. He was found out and the owner chased him. He got panic and buried the chicken in some mud. Later when he come back, he dug out the chicken, without bothered to clean the chicken, he bbq it on open fire with its feathers and mud still on it for a long time. When he cracked open the mud he was surprised how fragrant and tasty the chicken was. He then told his friends and words started to spread throughout the village, so this method of cooking chicken (obviously with cleaned chicken later) become very popular. Everyone referred to this as Beggar Chicken. Sometime later, the Emperor happened to visit this town and heard of this dish. He tried it and was really impressed. He renamed it as 富貴雞 Fu Gui Ji because it sounds better and fit for the Emperor. This recipe then spread very quickly to other parts of the country and abroad till now. I have no idea if the story is true or how close it is compared to all the other stories being told so far about this recipe. 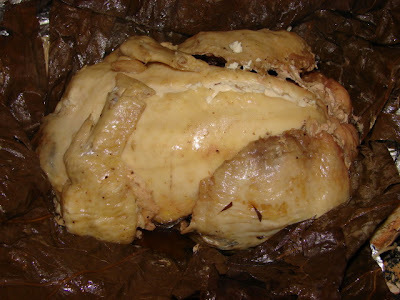 Beggar chicken is featured in many Chinese kung fu movies and stories about the Shaolin drunken master / beggar monk 濟公 (Ji Gong) who loved to cook chicken this way. Today this recipe is a lot more elaborate with a richer and tastier stuffing, many include some expensive Chinese herbs. Ingredients for the stuffing vary quite a lot depending on the chef or cook. The name of this recipe can be any of the three Chinese names mentioned earlier. Some restaurants and enthusiasts still prefer to use wet clay and straws to cover the chicken and bake in open wood fire as close to its original story and recipe. Some insist on certain type of clay from certain part of China and also mixing dried clay powder with wine to give that extra flavour. I have only made this chicken once long time ago and has forgotten most of the procedures, so I have to look up my recipe book again. I have no idea where to get the right clay or if any clay is toxic free. So the alternative for homemade recipe is to use a plain flour pastry. Lotus leaf is essential IMO as the inner layer wrap to give a lovely flavour. Get fresh leaves if you are lucky to find some, if not dried is fine too. Dried lotus leaves are easy to find from many large Chinese supermarkets. If you cannot find lotus leaves can sub with banana leaf or just put the chicken in a plastic roasting bag. This recipe has a wow factor if you make it for friends or dinner party. 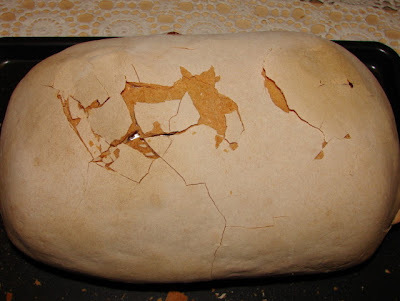 The cracking of the harden clay or flour dough crust is fun too. For the chicken get a flavourful chicken, free range or organic if possible I bought a free range corn fed chicken for this. For individual portions, poussin or cornish hen is suitable each guest can crack their own chicken crust to review the jewel inside. This is how I made this chicken yesterday. There is no cooking skill required. Just advance preparation and bung in the oven for few hours. Rinse the chicken then remove the leg bones and wing bones. Then crush the breast bone and back bone with your hand or a rolling pin. See slideshow. This is to make the chicken looks less bony, pliable and easier to wrap. If you can not be bothered to debone the chicken it's ok too. Marinate the chicken for 1 - 2 hours. Once you have prepared all the ingredients, put in a mixing bowl and pour in the chicken marinade juice. Mix. 2 whole lotus leaves, if dried reconstitute by boiling till softened, rinse then squeeze/wring out as much liquid as you can without breaking the leaf. For the pastry: Mix together 750g of plain flour (all purpose) with 2 tbsp of salt and around 400 - 415 ml of water to form a stiff dough. Once mixed leave for a while to rest then knead till smooth. Put aside for later use. The amount of pastry required depends on the size of chicken, this qty is for a medium size chicken. Cut away the hard centre core of the 2 pieces of lotus leaves. lay them flat and overlapping each other without showing holes, splits or openings. Put the chicken on top. Put stuffing inside the carcase and inside the legs. Fold the legs across and on top of the breast. Do the same thing with the wings. Then wrap the chicken with the leaves. Tie with strings. 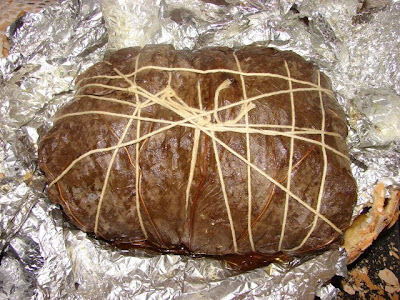 If you have roasting bag I would recommend you use it to wrap the lotus leaves parcel. Roasting bag gives a much better protection from juice leakage and evaporation of steam to soften the pastry. If you don't have a roasting bag, wrap the lotus leave parcel with several layers of foil. Be generous with the foil to fully and tightly wrapped the chicken parcel. Ensure you make all folding ends facing one side. Then roll out the pastry into a large sheet (about 5 - 6mm thick) big enough to wrap the chicken parcel. 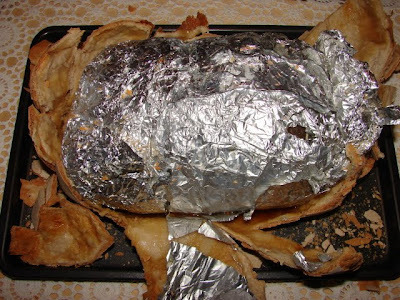 Put the chicken parcel on the pastry with folding ends of the plastic bag or the aluminium wrap facing down. Then wrap with the pastry, seal edges with a touch of water, make sure you seal the folding ends properly. Then turn the complete parcel upside down with the plastic/aluminium foil folding ends facing upward and pastry folding ends facing downwards. The whole thing was heavy and looked like a huge loaf of bread. Put it on a greased baking tray (greasing is necessary just in case the pastry will stick if juice running out). Bake at high temperature around 200 deg C for 30 -35 minutes then turn it down to around 170 deg C for another 1 hours 30 minutes for a small chicken or 1 hour 45 minutes for medium chicken. For single portion using poussin or cornish hen, bake for 20 minutes on high heat then another 45 - 50 minutes medium heat. Once the chicken is cooked. Crack it open with a hammer or rolling pin then remove all wrappings and enjoy. Here are some cracking and opening pictures. For this Chinese New Year Eve dinner, we hammered the crust 3 times first with 3 cheers, one for health, two for luck and three for prosperity. It was rather fun. Because the crust was a bit chewy I used a pair of scissors to cut the crust. Getting down to the lotus leaf layer. Revealing the star of the show. Not very pretty. There was quite a bit of juice. Some had seeped through into the pastry making bottom part of it quite gooey, and steam also made most of the inside pastry a bit chewy. Once the crust was opened we could smell the fragrance right away. When the chicken was finally revealed, it did not look like the prettiest presentable chicken but the flavour and taste was really really good and the chicken was tender, the stuffing and meat juice were yummy. The smell of this chicken did linger in the room for quite a while. I will definitely make it soon again. Will use roasting bag next time for minimum juice leakage. To maximise the use of the oven, I had baked a loaf of bread (while at high temp) and a fruit cake (at lower temp) while baking this chicken. Wow! Nice demo and write-up of this! I've had Beggar's Chicken at an expensive restaurant in HK, but I remember that the filling also had pickled Szechwan mustard cabbage (jai choy in Cantonese)...but yes, the lotus leaves are a must!